Kansas City, MO. April 17, 2018–A groundbreaking initiative to provide high quality, accessible, and inclusive programming for visitors who are Deaf or hard of hearing is underway at The Nelson-Atkins Museum of Art in Kansas City. The Institute of Museum and Library Services (IMLS) awarded the Nelson-Atkins a three-year grant to research and implement a rich array of public offerings through the Deaf Culture Project, as well as to hire a Coordinator for the Deaf Culture Program. In her new position, Lucy Crabtree will deepen existing relationships with the Deaf and hard of hearing communities and coordinate the museum’s annual Deaf Culture Day. 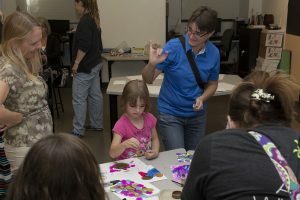 The Nelson-Atkins will create a suite of interrelated activities designed to build engagement and learning among visitors who are Deaf, empowering them to participate in the museum’s collections and programs. “We are excited to have the opportunity to collaborate with community stakeholders and partner organizations such the Museum of Deaf History, Arts and Culture, The Whole Person, and the Kansas School for the Deaf,” said Christine Boutros, Manager, Community & Access Programs. This program builds on a 2015 initiative, in which the Nelson-Atkins formed an Advisory Committee for Accessibility to work with people with disabilities. Other programs arising from this committee include Low Sensory Mornings and Relating to Art, and current tactile tours have been revamped. The Deaf Culture Project will be developed with Deaf and hard of hearing communities across greater Kansas City and will provide a model for museums around the country. Over the coming months, the museum will work to identify and understand what programs, approaches, and strategies would have the greatest and most positive impact. Focus groups will discuss opportunities, challenges, and benefits that will inform project planning and development. Programs could be implemented by Fall 2019.